WELCOME TO OUR EXCLUSIVE TOP QUALITY BREEDING HORSE FARM. WE SELECT THE HIGHEST QUALITY MARES FOR THE BEST FOUNDATION. CHAMPION TITLE, AND TOP OF THE LINE PEDIGREE'S. WE SEARCH THE WORLD TO FIND THE BEST STALLIONS TO BREED OUR SELECT MARES TO. ONLY PROVEN PERFORMANCE STALLIONS, WITH KIND CHARACTER,PERFECT CONFORMATION AND PEDIGREES ARE CAREFULLY SELECTED. WE HAVE BEEN BREEDING FOR OVER A DECADE. REST ASSURED YOU ARE GETTING A VERY SPECIAL HORSE FROM US. WE ARE A SMALLER BREEDER AND APPRECIATE YOUR SUPPORT ! Meet Black Fire Renoir BFF - Our Premier pure Dutch Friesian Reg 17H Stallion. After 15 years of breeding we have our Dream Stallion. Renoir is everything you could want in a friesian stallion. Flawless conformation and exceptional character and trainability. Going VERY well under saddle. 2016 Mane Event Champion Stallion ! A dream to ride and train. Available AI only , with limited bookings . 2018 is full. 2019 spots left. Email for info. We are considering opening our book for breeding to outside mares. We ask mares be registered, sound character and conformation. Fleck is STUNNING !! LOOK at his perfect conformation ! That shoulder angle, hip, neck set, topped with gorgeous face. He is perfection. Is registered with Friesian Heritage Horse. Dam our 15H Reg Appaloosa Mare Flower . Flower had a 2 page DNA Etalon test and she is also genetically sound. Fleck's sire is our 5yo 17H Friesian Stallion Black Fire Renoir. Our Friesian Stllion is CLEAR- no hydrocephalitis/ no dwarfism. This is our hold back colt we have decided to offer for sale . Stunning looks, great stallion potential . Will be 2 yo 5/19 . Reg. papers with FHH inhand as gypsian. All genetic testing done, and clear. Asking 13k as stallion and would like a breed back option in future for this gorgeous special colt if left intact. Discount 2 k if gelded . Stunning color and character. Only one I know of in the USA. Out of our gypsy stallion Chrome Crush BFF and Irish listed below . GVHS Reg. Almost 14H at 2 yo . Out of our 15H Gypsy Stallion Chrome Crush, and our Gypsy mare Betsy Ross. Blue is a wonderful stud colt, leads, trailer loads, stands tied, bathes, all around good boy. We have not used him for breeding. Our stall cleaner has sat on him no problems, but he is not broke to ride. VERY BEAUTIFUL BOY !! We would like to take a moment to thank you for visiting our website. Our for sale page may not have everything listed we have for sale at this time, so if you are looking for a certain horse, just shoot us an email and ask. We have 5 foals due 2019. Sire's are our 15H Grand Champion black silver dapple gypsy stallion GVHS Reg. PSSM1 Neg- Chrome Crush BFF . Our other stallion is 17H Mane Event Champion Friesian Stallion- Renoir . We have one purebred friesian foal coming and crosses with roan and other rare colors . Please see our Services page for info on our breeding to our wonderful proven stallions. Ben is a SUPER sweet and bold solid black colt. His dam Lanai our 16.1 H Dutch reg pure friesian mare. His sire our Grand Champion 15H Gypsy stallion Chrome Crush BFF. Ben will look like an old school friesian with tons of hair and bone. He has a perfect face with large kind eyes. Uphill, forward and correct conformation. 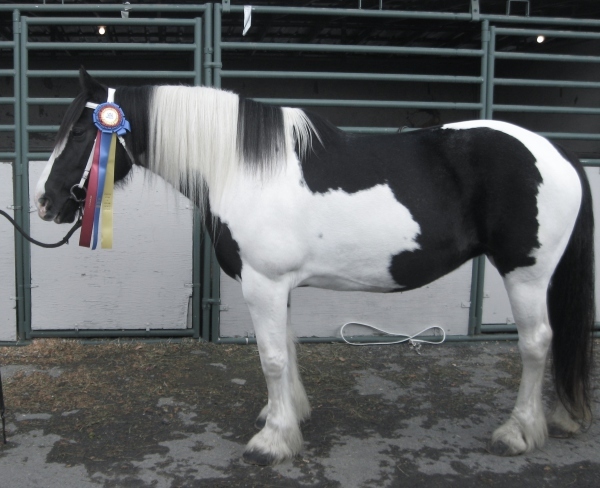 He can be reg friesian sporthorse, & gypsy drum with GHA. ** SOLD** Another GREAT home !! VERY STUNNING PERFECTLY MARKED FILLY . REGISTERED WITH FRIESIAN SPORT HORSE ASSOCIATION. BORN 6/2014 .HER DAM IS HOPI-DOUBLE REGISTERED PAINT/PINTO . A DREAM TO RIDE. SIRE IS GOFFERT STALLION THAT WE HAVE SOLD OUT OF STATE. GOFFERT IS A VERY RARE GRAND PRIX LEVEL APPROVED FPS FRIESIAN BREEDING STALLION. GOOGLE GOFFERT FOR VIDEOS AND INFO. CIRCE IS VERY CORRECT IN BOTH MOVEMENT AND CONFORMATION. ** THANK YOU JB ! !